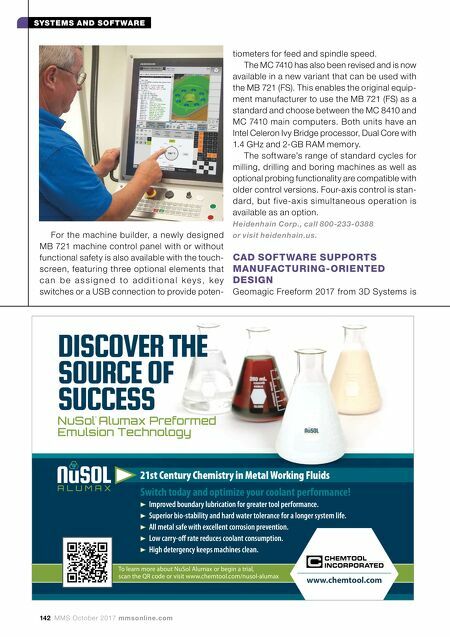 mmsonline.com October 2017 MMS 143 SYSTEMS AND SOFTWARE intended to provide a single engineering platform to help users meet designing and manufacturing challenges. The sof tware enables users to create and manage four different types of 3D part geom- etries, of fering flexibilit y and design control. This single design environment delivers prismatic s o l i d p a r t s , l a t t i c e s t r u c t u r e s , v o x e l - based embossed textures, virtual sculpting and other features, which t h e c o m p a n y s a y s result in precision-engi- neered designs with a b a l a n c e o f v i s u a l aesthetics, dimensional p r e c i s i o n a n d p a r t manufacturability. Among the features in the 2017 release are t o o l s a n d e n h a n c e - ments designed to pro- vide process optimiza- t i o n s t o p r o d u c t i o n work flows. Users can ge ne rate 3D c ompo - n e n t s s u c h a s t e x t labels or sleeves from an existing surface (with offset) based on a pro- f i l e; v i s u a l i z e c r o s s - s e c t i o n a l s l i c e s o f o b j e c t s a n d e x t r a c t i m a g e s o r c o n t o u r s (single or stacked); and export orthographic or turntable-based image sets, with options for background transpar- e n c y, c r o p p i n g a n d numerous other proper- ties aimed at eliminating downstream editing in both manual and auto- mated documentation workflows. I n a d d i t i o n to t h e new features, the soft- w a r e r e l e a s e a l s o includes enhancements Check out our product video (707) 838-6272 sales@microvu.com www.microvu.com EXCEL 501 Automated Machine 500x400x160mm $48,200 VERTEX 251 Automated Machine 250x160x160mm $35,275 SOL 161 Manual Machine 160x160x160mm $14,775 Prices include InSpec Metrology Software. Other models with sizes up to 2500x1600mm. AUTOMATE Measuring Parts? 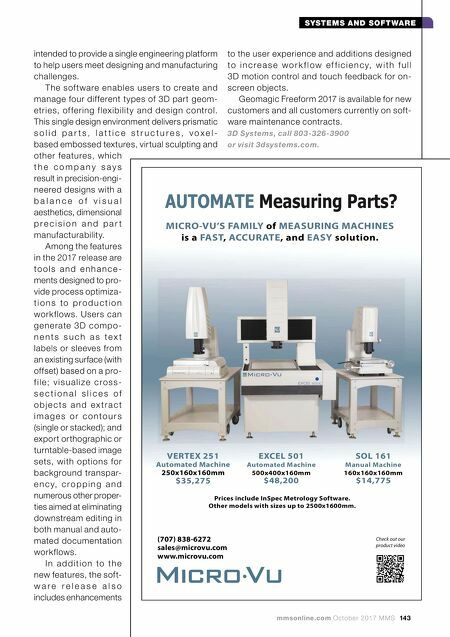 MICRO - VU'S FAMILY of MEASURING MACHINES is a FAST , ACCURATE , and EASY solution. to the user experience and additions designed t o i n c r e a s e w o r k f l o w e f f i c i e n c y, w i t h f u l l 3D motion control and touch feedback for on- screen objects. Geomagic Freeform 2017 is available for new customers and all customers currently on soft- ware maintenance contracts. 3D Systems, call 803-326-39 0 0 or visit 3dsystems.com.